Here, I cover 5 Instagram grid simulator Android apps. Using these apps is so easy. All you need to do is select any image from your phone’s gallery. Then, cut that one image into pieces. You don’t need to crop images focusing on the size. The app lets you divide one image into 3, 6 and 9 slices very easily. Thereafter, you can save all the images or directly share on Instagram in orders. A few of these apps let you split image as 2×1, 2×3, 3×1 and so on. One of the apps even let you make Instagram grid more creative. You can add more grids, shapes, colors, etc. While using the app, you might encounter ad- pop-ups but it won’t be distracting. You can use these apps for free to split images. Make your Instagram feed look unique using an Android app. Let’s try each Instagram grid simulator and create your Instagram feeds interesting to scroll. 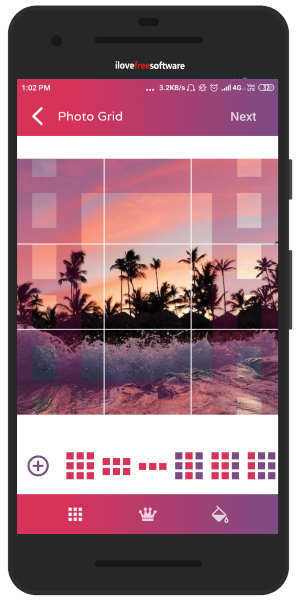 Grid Maker is a free Instagram grid simulator Android app. After installation, when you open the app, you will see an option to open Gallery. You can select any image from your phone. After that, you can select the grid size of an image. There are sizes like 2X1, 2X2, 3X1, 3X2, and so on. If you select 2×1, you can split the image into two parts and if you select 3×6, your Instagram post splits into 18 images. Once you select the size, you can apply it by clicking on Done. Thereafter, all the images split into pieces mentioning the numbers on photos. You can tap on the picture in orders, for example, tap on picture 1, 2, 3 and so on. Then, you can save the image. All the images get saved on your gallery in the same order as you mark them. After that, you can share each piece of the image on Instagram and make your Instagram feed interesting. 9square is another Instagram grid simulator app. When you open the app after installing it, you will see an image icon. Then, you can click on that in order to browse a picture from your phone. Once you add a photo in the app, the sizes to crop image appear on the top. You can opt any size to split the image into 3, 6, 9 parts. Also, you can rotate and flip images as well. Once done, you can click on Crop on the top right. Now, all the images can be saves in your phone. Also, you can directly share on Instagram one by one in orders. PhotoSplit is also a good option as Instagram grid simulator app. The app lets you upload an image from your phone. Using this app, you can split the image into 3, 6 and 9 Pieces only. You can rotate, move, and zoom the image as well. After that, go to the Split option located on the top right. Then, you can tap on the pictures in sequence and post directly on Instagram. Also, you can save all the split images on your phone. 15 Square is a free Instagram grid simulator app. As the name suggests, the app lets you split one image into 15 images. 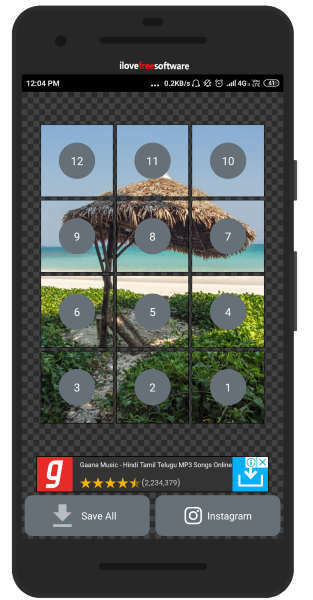 Once the app is installed, you can open the image from your phone’s gallery. Then, you can divide an image as 3.1, 3.2 and so on. Also, you can zoom and move the image if needed. After that, you can click on the Crop photo in order to split the image. And then, you can share all the images by sequence on your Instagram account. Photo Grid is one of the good Android apps. You can use this app as Instagram grid simulator. After opening the app, you can select the image from your phone’s gallery. The good feature about this app is that you can split one image into different ways. You can divide the image into 3, 6, and 9 pieces. Also, the app lets you can add more grids. Besides that, you can highlight a few images and make other images disappear. The app has other options like shapes and colors. Using different shapes can make your Instagram post look more interesting and creative. The color option is good to make the boring grid colorful. You can choose any color, set opacity and hit the Next button to create a grid. If you wish then you can overlay images. Not just this, after creating an Instagram grid, you can edit, add text, stickers, etc., within the app. Then, you can share the image on Instagram by sequence. Posting a single image on Instagram is very common. People try to make their Instagram account look creative by using a color theme, layout, grids, etc. You can use grid maker app on your Android phone to split pictures. Then, post it in sequence on Instagram so that when people visit your profile, they will see photos in huge size which look captivating. So, try these apps and do some experiment with your Instagram feeds.